We arrived in Mui Ne after a 6 hour bus ride and got a very pleasant surprise when we checked into our hostel, perfect location and our room was overlooking the beach. So after 5 days of pretty much doing nothing but sunbathing, we were on our way to Saigon. After Hanoi we were expecting Saigon to be a bit crazy and we were not let down. We eventually found our hotel which was quite nice, dumped our bags and headed out into the city. We got chatting to an English guy who had just moved out here to teach English. It sounds unbelievably easy to do, so Sam was quizzing him for a while. I was getting quite worried when he actually sounded like he wanted us to do it too. Apparently there is a school in Cambodia where you can volunteer, so we may do that for a couple of days but as for a career change, I don’t think so. The next few days were a bit of a disaster. Sam got quite ill on the Sunday with a bad tummy and didn’t get out of bed for almost 3 days. So I did my best to look after him, getting him water and trying to get him to eat bread and bananas. On Sam’s birthday (Monday) I persuaded him to come down to the hotel restaurant for some food but he only managed a bowl of steamed rice. The next day when Sam asked me if I thought the peanut M&M’s I had bought him as a post illness/birthday treat would be ok, I knew he was starting to feel better. By Wednesday he was feeling a lot better so we set out to explore Saigon and found a market or two. I was looking at a top when I heard ‘that looks like it will fall apart after one wash’…I didn’t realise I had brought my Mother with me! As Sam was feeling much better and his actual birthday was pretty rubbish, we decided to really treat ourselves and blew the budget on a steak dinner. We had fillet steak with potato gratin and red wine, I don’t think we spoke for the first 15 minutes, we just kept eating with silly grins on our faces. On Thursday we went to see the Cu Chi tunnels outside of Saigon which are a maze of old war tunnels used during the Vietnam War. They are described as a spider web of tunnels and took 20 years to create. We got to see lots of the Vietnamese trap tactics from the war, mock ups of how rooms in the tunnels would have looked and finally got to go into the tunnels ourselves. We were shown a hole in the floor where they used to hide, and is barely big enough for a small Vietnamese person. When the guide asked if anyone wanted to go down, I stupidly said yes. I had to climb into a hole no wider than me and go underneath and close the roof….all fine until I had to get out again. Sam ended up having to pull me out. Not embarrassing at all. 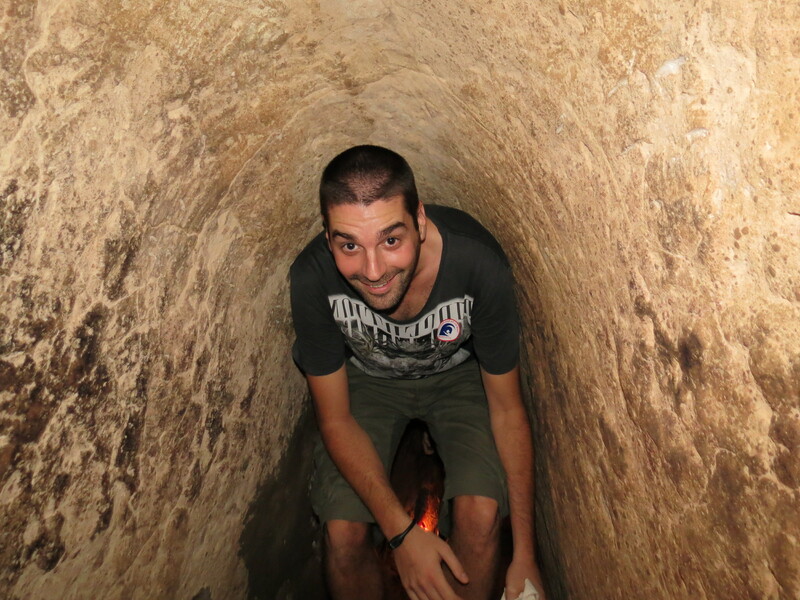 We then went into the proper tunnels which were about 1m high, a struggle for someone my height so Sam being 6.3ft found it quite difficult. We probably only walked /crawled about 60m underground but when there is no light and no air, it felt like forever. It was good fun though. On the way back from the tunnels we were dropped off at the War museum. We had been warned it was quite graphic and disturbing and they weren’t wrong. It was very interesting none the less but we did leave feeling very sombre and thoughtful. In an attempt to lighten the mood we went for a few beers, where a local Vietnamese girl challenged Sam to a game of darts. It was quite amusing to watch as the 4’8” girl looked like she was going to beat him. He was quite relieved to end up beating her 2-0. Tomorrow we begin our journey into Cambodia via the Mekong Delta which we are very excited about. We have thoroughly enjoyed our time in Vietnam, it’s a place full of history and culture and I would definitely recommend it as a place to see. Madness, is the first word that springs to mind when thinking of Hanoi. I thought we were lucky to arrive in tact from the cab journey from the airport to our hostel, and that was in a big 4×4. On getting out of the cab and having cross the road, I thought our luck could change. There are literally thousands of bikes everywhere. They go in every direction possible, including pavements and roads and the direction of traffic doesn’t seem to matter. Well we made it across the road to check into our hostel, dump our bags and head into town. 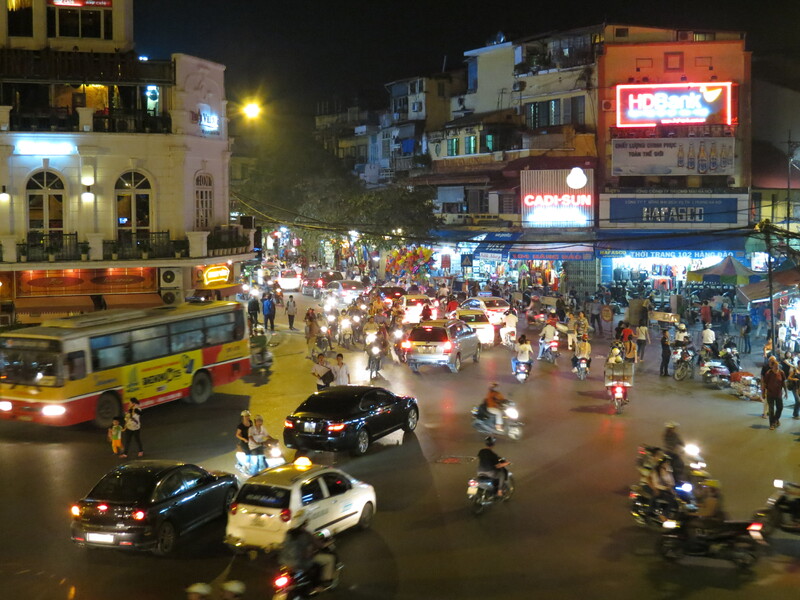 Hanoi wasn’t really what we expected, as we thought it would be more built up than it was. 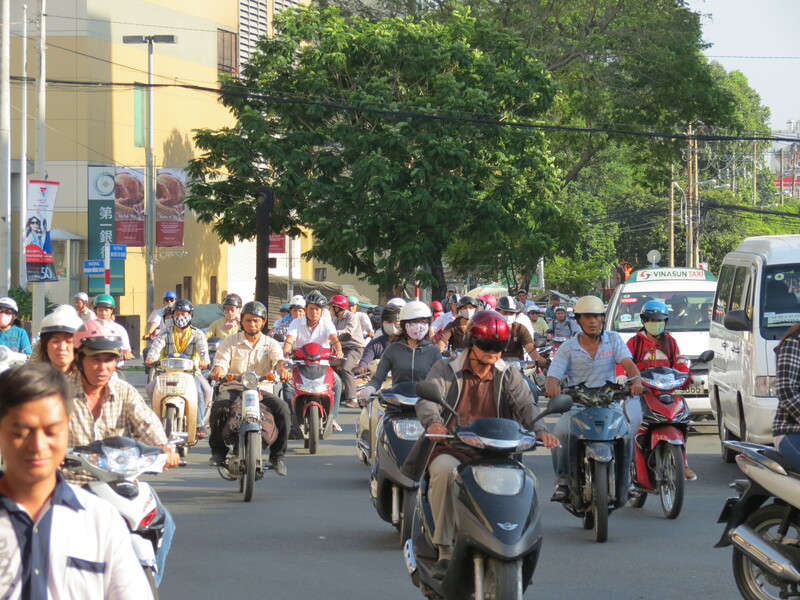 It wasn’t a bad thing, but we didn’t think there was a great amount to do in Hanoi other than wonder around the city. One thing that we did find that was a highlight of Hanoi was Bia Hoi. This is a local home brew rice beer made by various bars in the Old Town. It costs 25p, and is definitely worth a try. It only lasts about a day before turning, so they only make it in small amounts. It basically means that you have to get to the bars before they run out for the day. Another thing that I got roped in to was going to see the Vietnamese water puppets. The fact that it only cost about £1 each was the only reason I let Katy talk me into it. It was probably something that we should have seen, so there is a positive there. But to honest, it was probably only worth the £1 we paid. It’s very traditional for this region apparently, so that was our cultural input for the month. 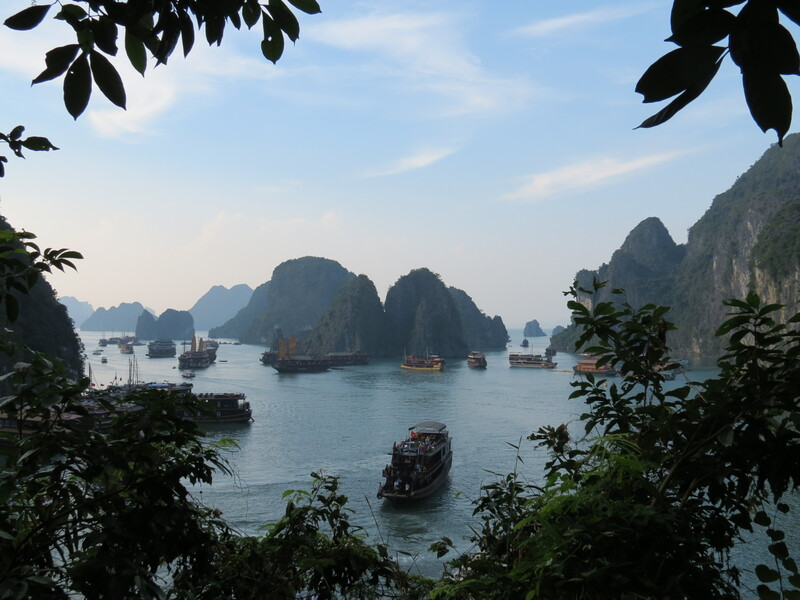 To escape the busy city we decided to take a three day trip to Ha Long Bay. This area has around 2000 islands and some very stunning views. We spent the first on the boat, before getting time to do some canoeing and swimming. We had a really nice seafood dinner on the boat from the locals days catch, and this was supposed to be followed by a night of karaoke. However as most of our groups were more interested in drinking on the sun deck, we left the singing to the crew, which they seemed quite happy about. The next day the boat dropped us off on Cat Ba Island, where we went to take a look at some of the caves that the Vietcong used during the ‘American War’. It was quite a network of tunnels, that included a cinema and a swimming pool. After this we took our first bit of exercise of the trip, a 5km bike ride through the mountains. That probably makes it sound more difficult than it was, but I can live with that. Besides Katy made it look more difficult than it was. We then spent the night in a eco lodge in the middle of a national park. It was very quiet other than the cows and geckos, and good to relax for the night. While we were there, we found out that the next two places that we were planning to visit, Hue and Hoi An, were flooded. It all looked quite serious as 88 people had died. However when we returned to Hanoi the next day, our hostel were adamant that we should still get the bus to Hue, and that no refund would be offered. Now call me picky, but I’d rather not spend hours in huge traffic jams waiting to get into a city that in under one meter of river water. After much arguing, we decided to give up. As the entire area was flooded we had to get a flight to our next stop, Nha Trang. The flight was booked for 7am the next morning, so we decided to drown our sorrows. We went out with some people that we had met on the Ha Long Bay trip, and all of us (due to the unexpectedly good weather) went out with an amazing set of panda eyes. We got back to the hotel at 12:30am and leaving enough time for about 3 hours sleep. Lets just say that we weren’t looking too perky at the airport that morning. 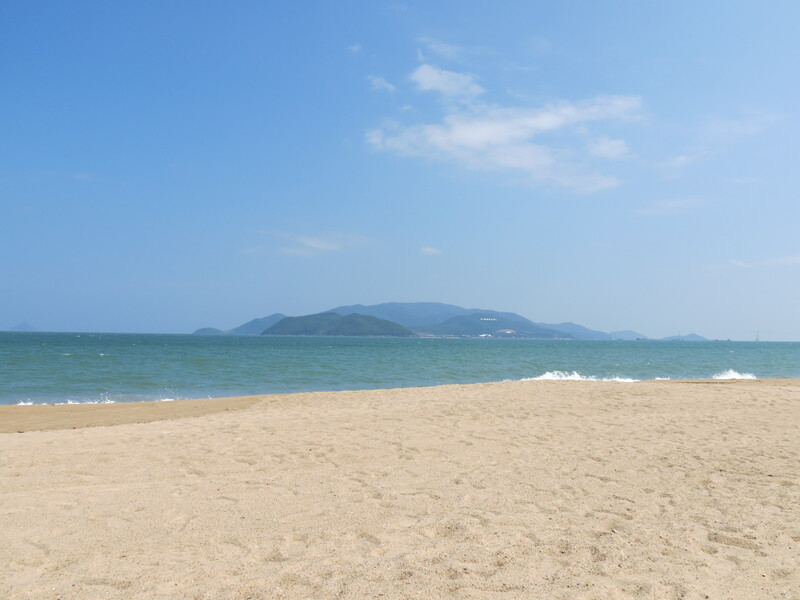 We’ve spent the last few days in Nha Trang enjoying the beach and good weather. There are a few islands in the area that we could have gone to visit, but we decided against it to just chill out on the beach. We’re moving onto Mui Ne next, which is another beach resort 5 hours south of here. Hopefully moving south will bring more sun. It’s been two weeks since the last post, and that’s been a very busy and drunken two weeks in Hong Kong. Writing this post on the flight over to Hanoi, my body is craving water, fruit and sleep. None of which I am likely to see any time soon. In fact the first beer of the day has already been consumed. As Katy had previously lived in Hong Kong for two years back in 1995, she decided to take on the role of tour operator and guide. We began with a night staying at the infamous Chung King mansions. Katy really didn’t want to stay here, but we got our dates wrong for leaving China, and didn’t really have much choice. To be fair to Katy, it was probably the smallest room I have ever stayed in. But it was clean and safe (other than the lifts) and that is the main thing. The next day we checked into our hotel which was lovely. 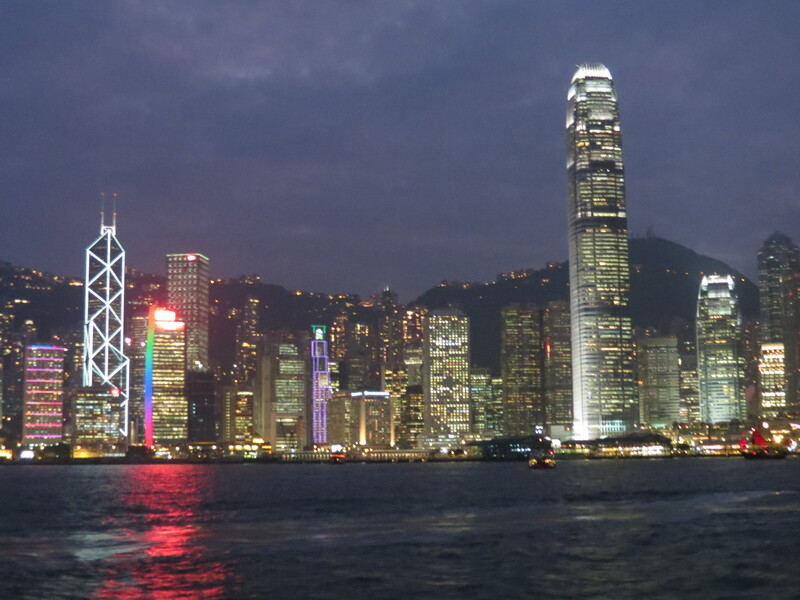 We spent the first night floating between Tsim-Sha-Tsui in Kowloon and Lan Kwai Fong in Central. It took a bit of getting used to how much more expensive Hong Kong is compared to China. We went from paying about £1 for a pint of beer in Shanghai to about £6 for a pint in Hong Kong. We very quickly learnt to exploit the happy hours. It didn’t take us long however to find a good dumpling restaurant which was cheap and cheerful, but did the job. The Hadcroft Holidays tour then took us to the peak where we got some amazing views over Hong Kong. We took a walk around the peak, and then headed back to Kowloon to take a look at some of the markets. When I say some of the markets, I mean all of them. We did the Bird Market, the Flower Market, the Goldfish Market, the Woman’s Market, the Jade Market, the Temple Night Market. It’s not exactly my idea of fun, walking around trying to stop Katy from spending all of our money on fake tat, but it did work up an appetite for a beer or two that night. 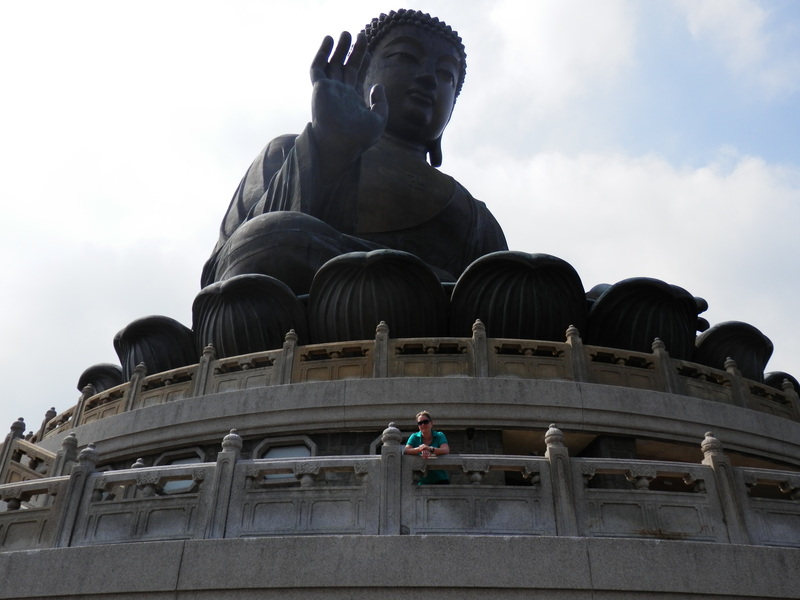 The next day we went to Lantau to see Big Buddha. We got the ferry there, which was about an hour from central. Katy has fond memories of Big Buddha as her dad used to ask for some luck with the Bolton results. Only time will tell if climbing those steps makes any difference to Bolton this season. While on Lantau we also went to see a little fishing village called Tai O, which was very different to other parts of Hong Kong. We then got the cable car home which was quite cool. We found out that it was the last night of the racing season, so we decided to head over to Happy Valley race course for a night out. It cost about £1 to get into the general enclosure, and it was a really good atmosphere. We came out just about even for the night thanks to my winning bet, so it was a good night. Dave and Shiona arrived soon after for a week in Hong Kong. I thought that their arrival would make for some more sensible nights out. How wrong could I have been? We started with a night at the Hong Kong cricket club, where we had a nice meal and among other things witnessed Arsenal beat Chelsea 5-3. We then descended into Wanchai for more drinks at Dusk Till Dawn. The next morning we were all feeling a bit delicate, and not really in the mood to continue drinking. So the Champagne brunch that had been arranged didn’t really appeal. A few plates of food and a glass or two of Champagne changed that very quickly, so we then made our way to Kowloon cricket club to watch the Cricket Sixes. This format is basically 6 overs with 6 per team on a smaller pitch. Everyone has to bat and bowl (except the wicket keeper), and it’s quite exciting as they basically just whack it out of the ground every second ball. The final was England vs Pakistan, and Pakistan won after hitting 177 and bowling England out for about 140. The following day we decided to give our bodies a bit of a rest and took a trip to Lantau Island for lunch. We sat and had a Thai lunch on a really nice beach, enjoying the sun and relaxing. That was until Katy and I were attacked by wasps, causing me to knock over a beer which landed on top of our new camera, face down in the sand. It’s a good job that we’re not travelling on a budget as we’re now on camera number two after failing to get it working again. We decided to get over the pain of this by drinking some more. We returned to the Hong Kong Jockey Club at Happy Valley race course the next day and enjoyed an all-inclusive day for the Melbourne Cup. With free wine and champagne flowing all day, we soon forgot that we even had a camera, never mind had broken it. After several lost bets and several bottles of wine, we decided to head to Soho for a night cap. As Katy, Dave and Shiona knew various people in Hong Kong, a night was arranged where everyone could come and meet. This again was in Soho, and again was a very drunken night. When shots are being bought at 8pm, it’s a good indication that you may lose a large chunk of the following day. And the following day when Dave asked if he came home with us gives you an idea of how the night turned out. So we’re now on our way to Hanoi for some recuperation. Although we both really enjoyed Hong Kong, we ready for a change and looking forward to seeing another country.